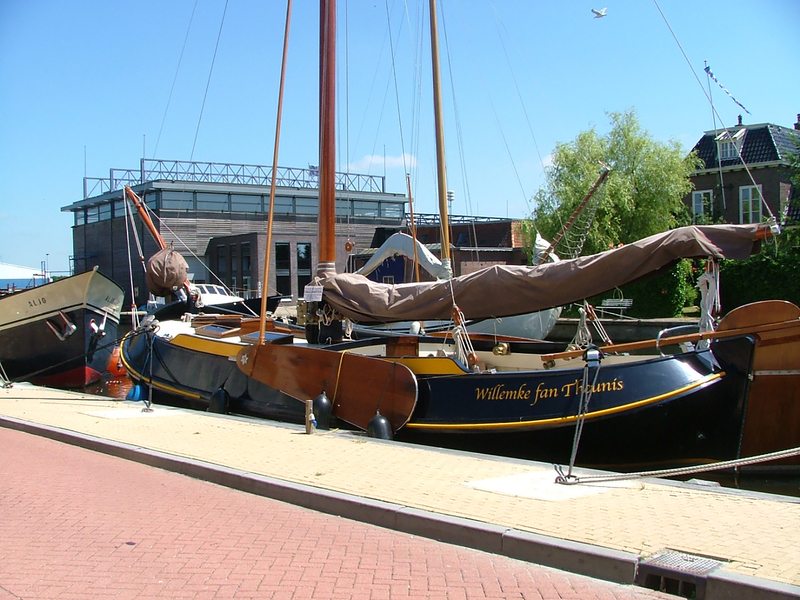 A Lemsteraak is a traditional Frisian yacht with origins in Lemmer. Our “Willemke fan Theunis” is a newly-built Visserman model. This ship, which first sailed in mid-2004, is a real eye-catcher in deep blue with its ochre-yellow flat bottom. It is 13 metres long and more than 4 metres wide, but the draught is just 0.90 metres. The dark brown sails cover a surface area of 122.5 m2. The ship is fitted with a 100-hp diesel engine. The Lemsteraak is best known for its excellent sailing qualities, beautiful characteristic lines, and domed head. She is equipped with every modern amenity when it comes to safety and comfort. This type of manoeuvrable and seaworthy ship was used in bygone days for fishing in the former Zuiderzee. The steering compartment is a comfortable refuge when the water splashes over the cabin. The carefully-maintained interior guarantees a pleasant stay on board, even when the weather isn’t at its best. Sailing with “Willemke van Theunis” is an unforgettable experience, for both experienced water sports enthusiasts and novices alike. The sloshing water, fresh air, bulging sails, and lowered leeboard all make a trip in this yacht a memorable experience. Many a landlubber is mesmerised by the beauty of sailing, the water, the open Frisian skies and natural beauty, whether actively sailing or simply along for the ride. The “Willemke fan Theunis” is most at home on the open waters of the IJsselmeer, but is also very comfortable on the Frisian lakes. The culinary needs of those on board are not forgotten either. Depending on the passengers and their schedule, catering adapted to their needs will be provided, from simple fare to luxurious dining. One of the many options is a pleasant chat over a drink after sailing, a “Captain’s dinner”, and overnight stay in Hotel Lemmer. Signing up to for a trip on the “Willemke fan Theunis” guarantees a whole day full of fun and adventure. The proud ship and her crew will gladly help you enjoy all the beauty that sailing through Friesland on this yacht has to offer. Groups of up to 12 people are welcome. If there is sufficient interest in the summer season and good sailing weather, Hotel Lemmer guests can sail a half or full day on this beautiful Lemsteraak.